– Conegliano Valdobbiadene prosecco superiore di Cartizze. Let’s see together the main characteristics of these wines and the food pairings according to the opinion of experts and lovers. CHARACTERISTICS: It is a Spumante called Brut, obtained from white grapes coming from the grape variety Glera, characterized by a great quantity of bunches with golden and yellow grapes. During the vinification, it is compulsory to use the 85% of this variety, whereas the other 15% can be made of other varieties, like Verdiso, Bianchetta and Uva Perera. Their appearance is clear yellow, with a fruity and delicate perfume, with a pungent and rich taste. Its alcoholic volume is around the 10,50% whereas the acidity is around 5 g per litre. FOOD PAIRINGS: the serving temperature is between 7° – 9°C with starters of vegetables, first and second courses with fish and seashell. Moreover, it is perfect to close the meal. CHARACTERISTICS: It has a straw yellow and brilliant colour with a live perlage, the aroma remind fruity notes of apple and pear with aromatic notes of flowers and citrus that give to the palate a delicate and dry taste. It has an alcoholic volume of 10,50% and the acidity is of 5g per litre. FOOD PAIRINGS: its characteristics make it perfect to enhance aperitif, starters, simple first courses. Ideal serving temperature: 8°C. CHARACTERISTICS: it is a precious white wine obtained from grapes that don’t offer a continuous production during the year, but the small quantity of fruit in the territory are picked only once they are ripen. They colour is intense yellow, it present a persistent foam and on the nose it is pleasantly fruity with notes of pear, apple, almond and notes of honey. The alcoholic volume is around 11% with acidity of 5g per litre. 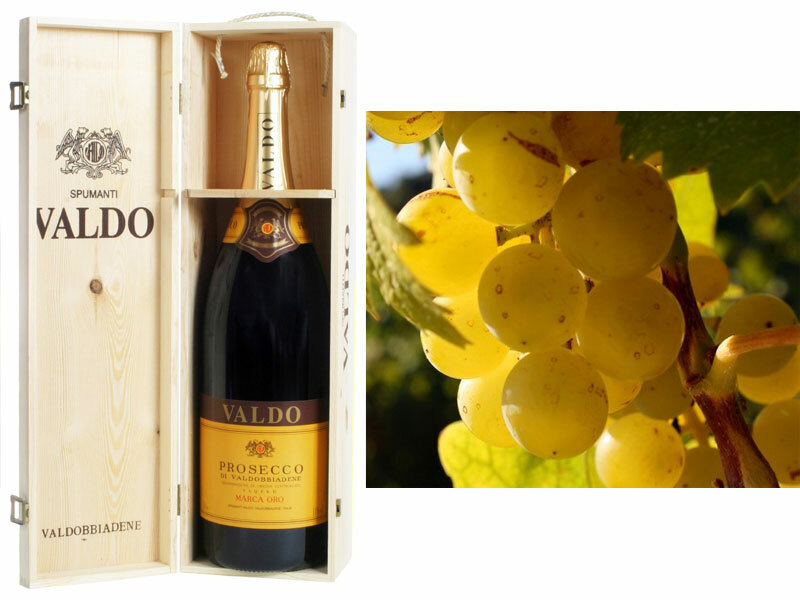 FOOD PAIRINGS: Prosecco Valdobbiadene superior gives its best served at a temperature between 8 – 10°C with starters with fish or meat. The name derives from the cru of the vineyards of origin of Prosecco, concentrated in a small area close to the hills between San Pietro di Barbozza, Saccol and Santo Stefano in the province of Valdobbiadene. In this territory the climate is particularly mild and the soil is mainly made of clay that allow a perfect drainage of the water; all these features offer to the vineyards favourable conditions to produce a valid product for the land. Prosecco Superiore di Cartizze is a rich Spumante wine, with a straw yellow colour more or less intense, with a lasting foam, that represent aromatic and fruity combinations with an aftertaste of almond. The alcoholic volume is 11,50%, the minimum acidity is 5g per litre. FOOD PAIRINGS: it is perfect to pair desserts, short crust pastry, focaccia and fruit tart. The serving temperature is between 8 and 10°C, so that you can perceive tastes and aromatic shades.